However, most mothers cannot afford taking a long maternity leave and are forced to go back to work sooner than one would want. Faced with those prospects, a mother would have to choose between stopping to breastfeed and pumping and storing the milk in the specially designed storage bags. Nowadays, breastfeeding pumps are essential to new mothers just as car seats and strollers are. Breastfeeding pumps offer the convenience to mothers who would like to go back to work and simply long to have a chance to dine out again with their hubby or friends. However, breast milk quickly goes sour if proper storage measures are not taken. Breastmilk storage bags can be the ideal storage option as they allow the milk to be stored for long periods of time and you could even freeze the milk in the storage bag if needed. What makes a good breastfeeding pump and storage bag? 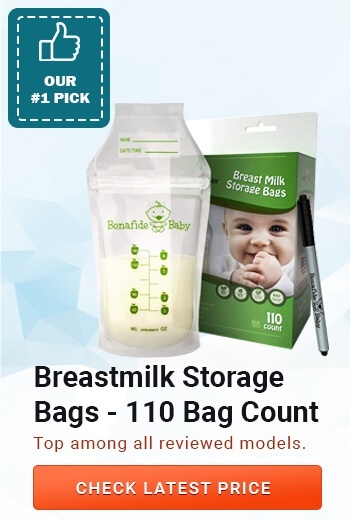 Bonafide Baby breastmilk storage bags come with a double zip seal that prevents the milk from leaking even when stored horizontally or in the freezer. The storage bags are made using only chemical free materials that do not contain BPA, BPS, and other toxic elements. The latex used in the production of these storage bags has been certified by CPSIA as baby-safe. The box comes with a toxic-free marker that mothers can use to note down the date and time they pumped the milk. This saves a lot of time and ensures that no toxic elements pass through to the milk from chemical inks in normal pens. The bags can stand on their own when filled to the right amount and this will safe space in the fridge. The pour spout is designed in a way that will prevent unnecessary spills and leaks during the pouring or the storage. 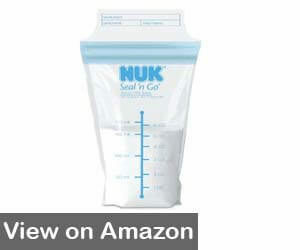 NUK Seal ‘n Go breastmilk storage bags are designed with a double seal to prevent precious milk leakage when in storage. The NUK bags are self-standing so mothers don’t have to worry about the pouches falling over or buying a special pouch container. This breastmilk storage bags are freezable and best non- toxic ones on the market. NUK brand has been around for nearly 6 decades and has long solidified their reputation as one of the most trustable brands for baby products. They are made in a way that oxygen barrier remains even when the bag is sealed, this helps to keep the breast milk fresh over a longer period of time. The breastmilk pouch itself has clear and easy to read markings, as well as name, time and date labels. The pouches are made from extra thick plastic that does not rip or tear easily, this prevents milk lose that can be very critical to mothers who have a very low milk output. 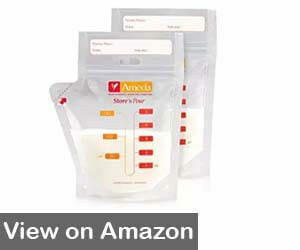 These Ameda breastmilk storage bags are resealable, this feature makes them highly versatile and functional. They would be perfect for mothers whose baby requires small amounts of milk but frequent feedings as they can be opened and closed several times without compromising the milk inside. The tear and spout part of the bag is conveniently located on the side of the pouch and has a very functional pouring nose design that prevents spills during the milk transfer. They can be stored horizontally in the fridge or the freezer thus saving space. Moreover, mothers can easily pump their milk straight into the Ameda breast milk storage bags using the flange adapter that comes with these bags. This saves time as it eliminates the need to pump into a separate container and only then pour into the bag. The thick latex that the bag is made from is multi-ply thus very resistant to splitting and tearing up. 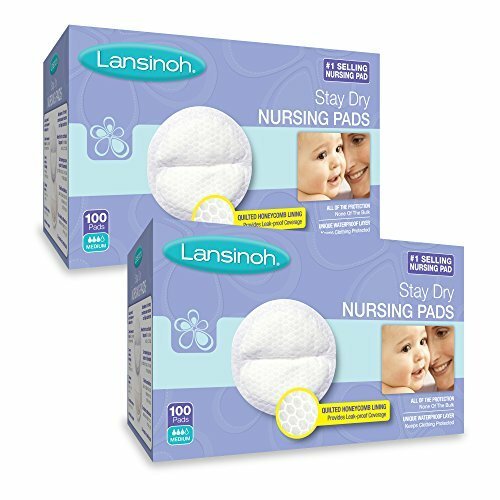 The lansinoh baby brand has been around for over 30 years and has gained considerable trust among mothers who value quality and reasonable pricing. They are pre-sterilized and come in a neat box that doubles as storage bag dispenser. 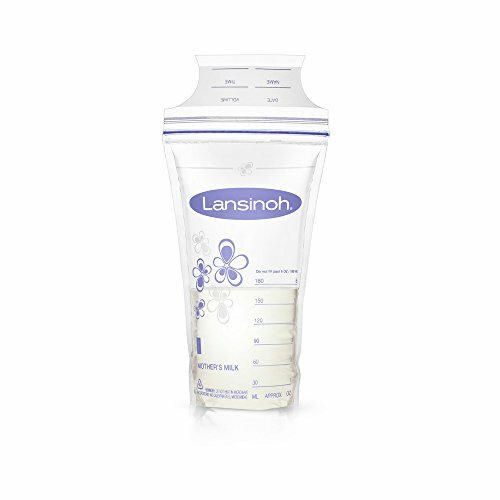 The Lansinoh breast milk storage bags are made using patented double click n secure seals that prevent leakages even when the bags are stored flat. They are regarded as the strongest breast milk pouches on the market because of their thick and double sealed gussets, as well as the leak-proof side seals. 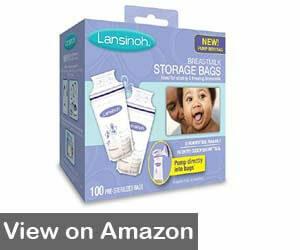 Moreover, you can pump the milk directly into the storage bags if you are using the Lansinoh breast pump. If you are expressing your milk using other pumps, you can purchase an adapter to facilitate the process. 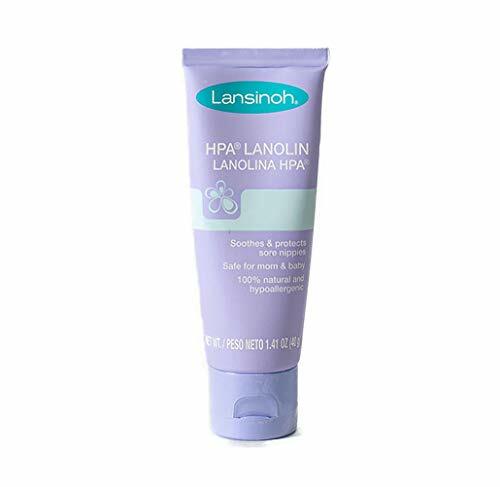 To check if your bags are compatible to be used directly with the pump, look for a white and purple flower that has a white marking line above the Lansinoh logo. 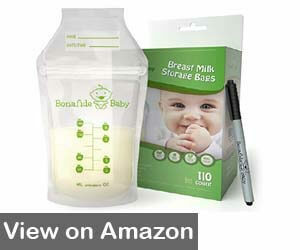 If the breast milk storage bag lacks this design, it is not compatible to be used with the pumps. 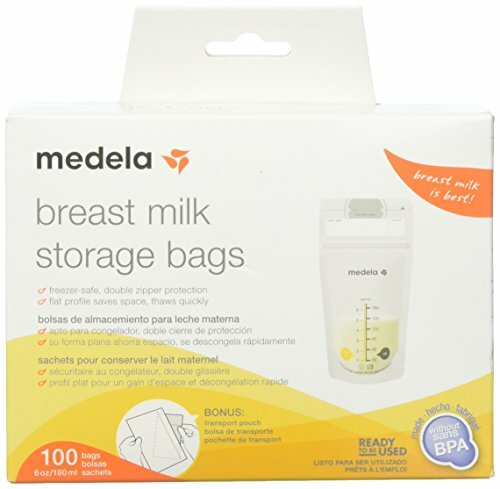 Medela breast milk storage bags come with two adapters that enable mothers to use the pouch bags with virtually any electric pumps available on the market. 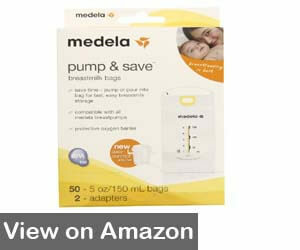 The only pump that these bags are not compatible with is the Medela Sonata Electric Pump. The top of storage milk has conveniently designed no-leak double zipper. The latex used in the manufacturing of these bags is toxic-free and hence contains no BPA’s, parabens and other chemical elements that be passed on to the milk. The protective barrier of oxygen keeps the milk fresh even if it’s frozen. Mothers can store the breast milk up to 3 months in the freezer; however, the pouches would need to be carefully thawed. Otherwise, the storage bags can rip at the side seams. The twisted pouches offer mothers superior leak-proof qualities that every parent longs for. There isn’t anything worse than spilled milk when your baby is crying and awaiting his milk. 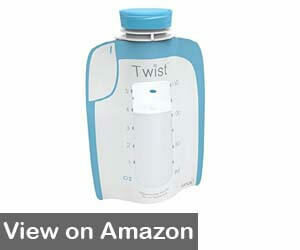 With these Kiinde twisted pouches you can pump, store and thaw in one twisted storage bag. This eliminates the need to transfer the milk over several containers and helps forgo messy kitchen countertops due to leaked milk. The single-use storage bags and caps are fully recyclable and biodegradable. Mothers can also feed their babies directly from the storage pouch using the Kiinde Squeeze Natural Feeding Bottle. Moreover, this helps prevent painful colic as the air is squeezed out when the pouch is inserted into the bottle before feeding. The breastmilk storing pouches are made using BPA, PVC and phthalate-free latex that is porous enough to allow for oxygen to circulate when kept in the fridge or the freezer. Some mothers have reported that the market has a lot of Kiinde counterfeit pouches and so one should look for seal on the box that resembles the brands logo and is holographic. The Avent bags come with a visible temper evident sticker that prevents the bags from getting contaminated. Plus, they are made from durable and high-quality plastic that has reinforced seam and dual layering. The double zipper helps avoid unnecessary milk leaks and the wide top opening allows for easy and mess-free pouring. Philips Avent clear bags adhere to strict industry standards and they too do not contain any harmful elements. Plus, they have a pleasant floral design that includes date and time tag, as well as, approximate ounce markings. To determine what type of breastfeeding pump will suit your demands best, you would need to look at several aspects of your daily life. For instance, think about your milk supply; is it abundant? If yes, a simple hand pump can do the trick for you, especially, if you are planning on using it once in blue moon. A standard hand pump resembles a cone shaped figure that you would need to adjust to fit your breast and then use the handle to pump the milk. If you know that you will be leaving your new born baby for more than a few hours on regular bases, an electric pump will be a much better option. Once you know how you will be pumping the milk, you would need to decide on what storage bags to purchase. Standard breastmilk storage bags are made using plastic materials and their sole purpose is store milk in different conditions, including, freezing and subsequent thawing. Breastmilk storage bags go through several stages of sterilization to ensure that they are ready to be used as soon as the box is open. Moreover, depending on the brand of the storage bags you would either need to use an adapter to pump the milk directly into the bag or pump the milk first into some sort of container and then transfer the milk to the storage bag. The first option prevents the milk from getting contaminated through the container and transferring process. Of course, you would still need to transfer the milk from the storage bag to the baby bottle once you are ready to use it. 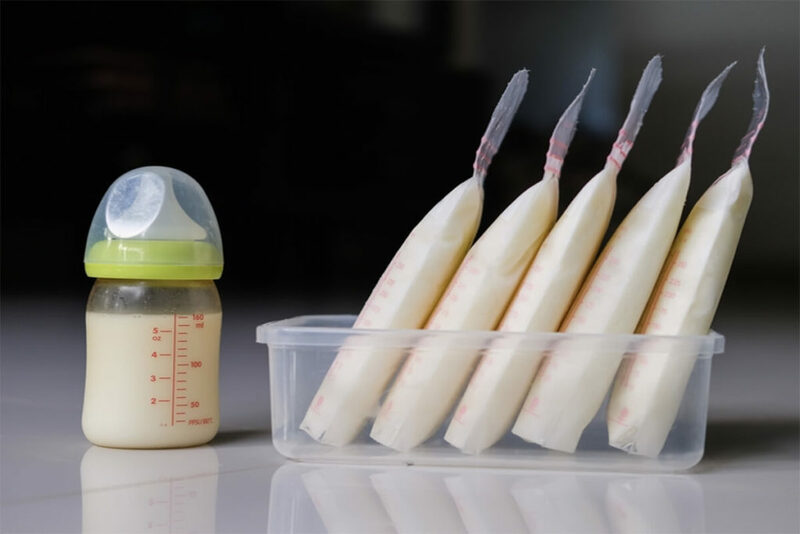 Some mothers try to use plastic sandwich bags as they look very similar to the breastmilk storage bags, however, sandwich bags are meant for a whole other purpose and will not stand the freezing and thawing process thus breaking or leaking the milk. 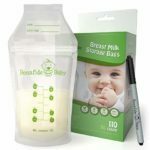 Breastmilk storage bags might not seem as a cheap option for milk storage purposes but they are the most reliable and convenient way of storing your breast milk. Their benefits include, cheaper price when compared to their plastic or glass container alternatives. Also, breastmilk storage bags are easily disposed of and are not bulky making them easy to be carried around. Plus, breast milk thaws faster in the plastic bags than in glass containers. They are, however, good for only one use and cannot be washed or reused again. Plastic storage bags can tear and leak creating unnecessary mess. Personally, I would forgo all these breastmilk storage bags except the Philips Avent ones. They have proved through numerous positive reviews to be the most reliable ones. Most mothers leave the milk pouches with the daycare personal, grandmothers or even stay at home fathers. Risking to lose breast milk because of tearing or leaking can create dreadful consequence to caregivers who are left without the milk and a hungry, crying baby. So above all, when choosing a good breast milk storage bag look to see how durable it is. The inaccurate marking can be dealt with if you measure the milk using traditional plastic or bottle containers before pouring the milk into the pouch. Just remember to never fill the bags to the full because the milk will expand once frozen and if there is no space for expansion the pouch will burst open thus spilling the milk all over the place. Another thing to look at is the temper proof seal, if it looks like it’s been teared or played with, it would be best if you skipped using that batch as the storage bags could be contaminated thus harboring numerous bacteria that the baby’s immune system is not ready to fight.